You may not be familiar with the story of Achimedes and the king’s crown, but there’s a good chance you know the word “Eureka!” and what it signifies. It means that someone’s had a marvelous, groundbreaking idea, one so exciting it must be acted on immediately. Katherine Ramsland calls this phenomenon a “snap,” and provides a wealth of examples of its effect upon inventors, scientists, and those in the business world. Even better, she also explains how you can set yourself up to “snap” and harness the effect to help your own work rise above the norm in creativity. A “snap” is more than a sudden flash of inspiration; it is “insight plus momentum,” a sudden realization so powerful that it propels the thinker into feverish action and eventual success. Snaps most often occur after we’ve been blocked by a problem and hit a dead end. Ms. Ramsland says the effect arises when our brains reset or “reboot” and suddenly reveal a solution. It doesn’t hurt to be smart to “snap,” but you don’t have to be a genius, either. What’s more helpful is having a strong sense of purpose and a big helping of curiosity—both will help you prepare and build a solid foundation to feed the brain’s “snap” mechanism. Ms. Ramsland offers many examples of the power of snapping, from Francis Crick’s sudden insight into the double helix structure of DNA, to Alfred Nobel’s decision to use the wealth gained from his invention of dynamite to fund the Nobel Prizes, to Anthony Zuiker’s leading him to create the popular “CSI” television franchise, to Tim Berners-Lee’s creation of the World Wide Web. In each case, the person was frustrated with a problem until a solution snapped into awareness and set them on the path to discovery and success. How does one create conditions for a snap? Author Ramsland suggests that you begin by treating your work as an adventure: a series of challenges that are preparing you for new discoveries. Every success, no matter how small, should motivate you to push forward. Preparation for the snap itself is a three-step process: scan, sift, and solve. Scanning involves setting goals and being vigilant about noticing new ideas and approaches. Sifting helps you sort out those ideas while remaining flexible and alert for “synchronicities” and new angles to solving a problem. The snap—the actual solving of the problem—can then occur when all the information absorbed falls together and breaks through the mental impasse that’s stymied us. 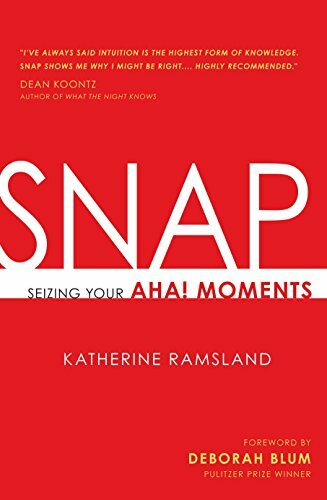 SNAP is a bit different from Ms. Ramsland’s prior books on forensics and criminal psychology, but her concise writing style and well-organized presentation—especially the “key points” delineated at the end of each chapter—make this a useful introduction to improving mental agility.